It has proven to be a safe, effective, and economical form of alternative therapy. Magnetic therapy is thousands of years old, yet holds great promise for the future as our population ages and the cost of traditional health care spirals upward. A stylish magnetic health, identity bracelet that can be engraved by us with a name. This magnetic bracelet is made from surgery grade stainless steel. A medium magnetic strength bracelet - It has 4, high powered 3000 Gauss Magnets (12,000 total) set within the rear of the identity plate. The stylish design of this bracelet and the fact that Stainless Steel is a strong, robust and very low maintenance metal makes it perfect for everyday wear. This Bracelet measures approx: 8.5" (21.5cm) in length and is 0.43" (1.1cm) in width. If no engraving is required, please leave box blank. 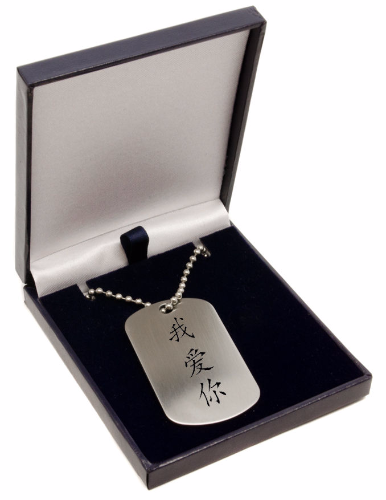 This tag features Chinese symbols which translates into English as 'I Love You'.